These pinholes are prepared from pure copper foil, 3 mm in diameter, 25 microns thick. They possess very high roundness and edge retention. Blackened on one surface. Mounted in black anodized aluminum discs. Mounted in a recessed hole in an anodized holder, 16 mm in diameter. 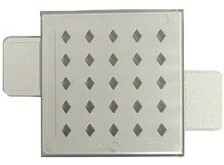 These grid boxes offer easy handling of the grids without damaging the support film. Storage for 50 grids in deep diamond-shaped wells. All wells are identified. The base is resistant to organics and reactions can be carried out on grid-mounted samples in the wells. Complete with grid recording card. The EMS25 is a small capacity grid storage box, designed as a low alternative to larger grid boxes where extra storage capacity is not required. The box has a sliding cover, allowing access to 5 slots at a time. Each diamond shaped hole is capable of storing a 3.05 mm or 2.3 mm diameter grid. Storage referencing is managed via recessed alpha numeric indexing on the sides of the box. The box contains two side features, allowing for easier handling during specimen removal, as well as a matte strip for extra notation. 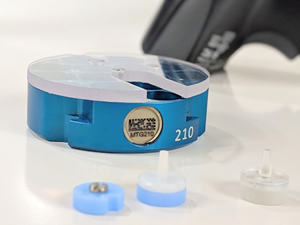 The EMS25 is also available with a unique number printed in blue on the face, code EMS25BN; batches with sequential numbers are available. Both boxes come with a durable 25 column card for record keeping. Our grid boxes are intended for use in both routine grid handling and for long term grid storage. 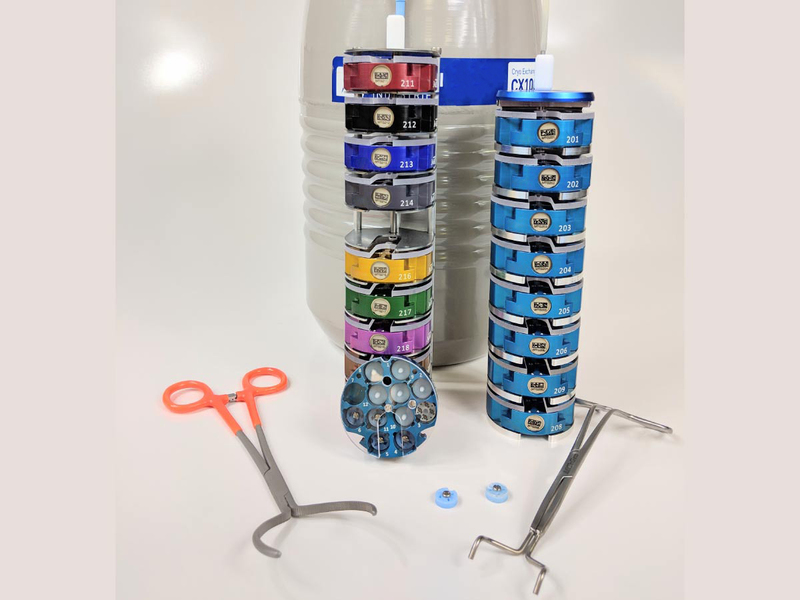 Their compact flat shape and low cost make them well suited for the transportation of coated grid products and for the long term storage of catalogued specimens. 100 grids can be stored in identified diamond-shaped wells for daily handling or long-term storage. Complete with grid recording card. Grids stored no longer jump out of the box while you remove the cover – Between the body of the box and the sliding lid, there is a separate plastic cover, which allows for only four slots being exposed at a time. This newly designed TEM grid storage box, for routine handling and long term storage of 50 standard size TEM grids. This new ergonomic design incorporates several features that overcome the disadvantages associated with storage boxes of the more conventional "sliding cover" design. This new box has a unique number on the face and on one end. The standard 100 capacity grid storage box with a unique number printed on the face and on one end. A newly designed grid storage box similar to the original LKB box. Made from a special plastic that minimizes static. Complete with grid recording card. For years, The LKB Grid Storage Box is the one that everyone is looking for. Now it is available again from EMS. The box is made from ABS (a copolymer of Acrylonitrile, Butadien and Styrene) which will not tolerate temperatures above 70°C, while the lid is made of Polymethacrylate (Flexiglas, Perspex), which should not be exposed to temperatures above 45°C. Neither the box nor the lid will resist organic solvents. 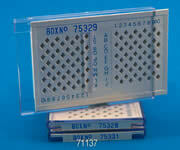 The box consists of 100 diamond shaped holes for storing up to 100 EM grids, either 3.05 mm or 2.3 mm in diameter. The box measures 3" (75 mm) (L) x 2⅛" (55 mm) (W) x ¼" (7 mm) (H) and it comes complete with 10 index cards. 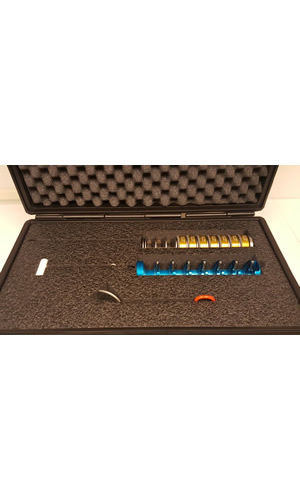 The EMS50 and EMS100 TEM Grid Storage Boxes are used for the storage of TEM grids for routine grid handling, transport and long term TEM grid storage for standard grids that are 3.05 mm in diameter. The box has a simple number/letter combination printed on the side of the body. Dimensions for both boxes are: 75 x 55 x 6.5 mm. Anti Static treated. A two tone color coded plastic box with insert which has 24 letter-labeled crossed slots, where the grids can be stored. A rotating protection plate covers the slots and allows for exposure of one grid at a time. 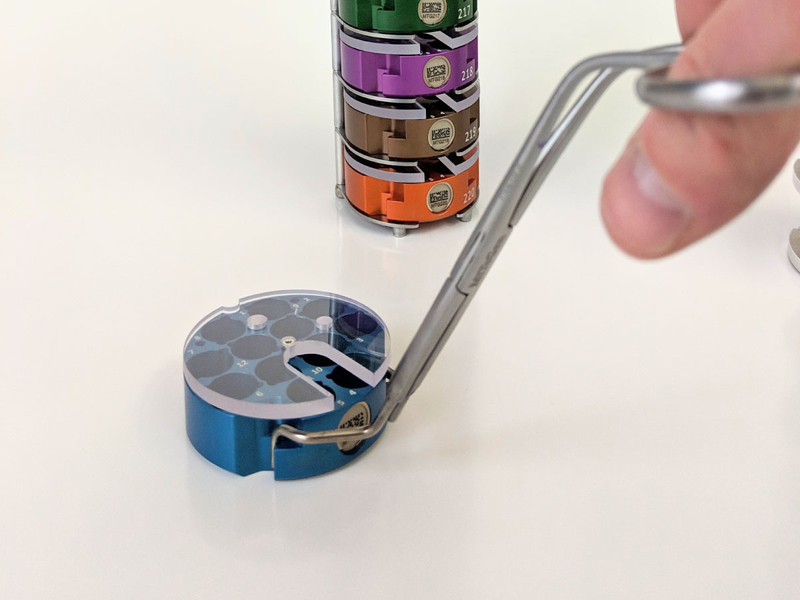 The same as Dial-A-Grid Module but with two additional cavities for block storage. 24 slots labeled with letters from A-X where the grids can be stored and rotated for easy access as well as 3 additional cavities for block storage. Available with and without a unique identification number. White silicone rubber mats, with numbered compartments. Good for organizing grids. They will not slide or jump between compartments. Also ideal for staining grids. Easy to pick up grids without damaging forcep tips. 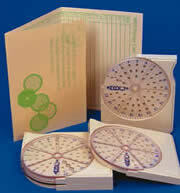 Mats are available for square and round petri dishes, (100 mm diameter). This unique Box allows for the storage and transportation of grids without any worry of them moving around or being damaged. 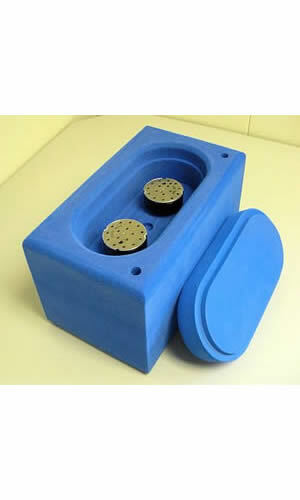 The Plate is made from Silicone and has 54 individual compartments 10 mm in size. Each compartment can hold 3 grids and the grids can be easily picked up from the Silicone surface. These unique trays, which are available in either black rigid ABS plastic or aluminum in black or tan. 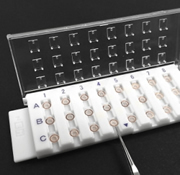 The trays feature 42 cells with a lip differentiating each cell. The cells measure 11 mm x 11 mm (7/16 x 7/16"). Tray measures 96 x 34 mm (3.78 x 1.34"). Trays perfect for placement of grids and storage of small components. 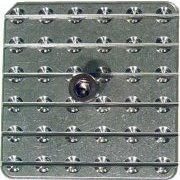 The EMS Domino rack is "U" shaped and made from an aircraft alloy sheet stock with serial perforations; thermally bonded spaceage copolymer; 5 mm diameter holes, 28 holes per rack. The formvar film cast on the rack will stretch across a series of smooth edged holes forming a flat, wrinkle free film that is ready for grid mounting. 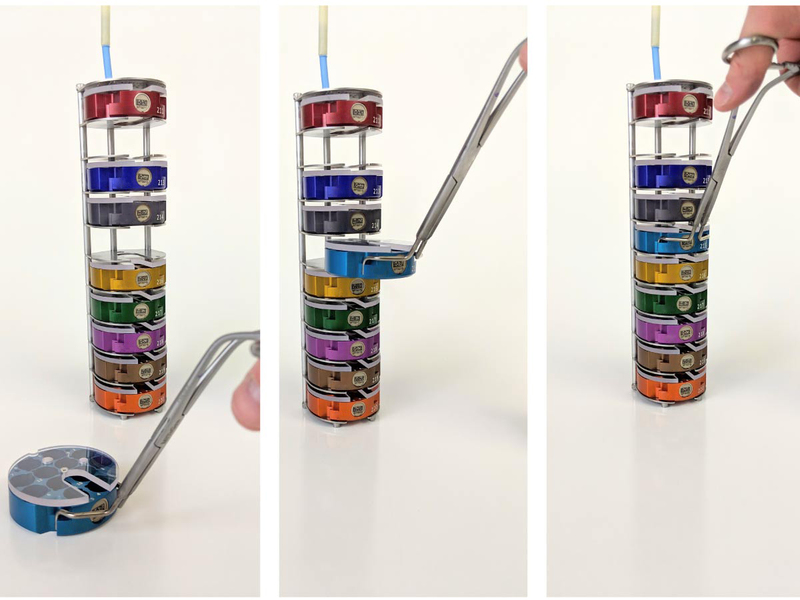 The Domino Rack allows the sections within the slot to dry flat and wrinkle free; it reduces the film and section contamination to negligible levels. Moran, D.T., and Rowley, J.C., (1987). "Biological Specimen Preparation for Correlative Light and Electron Microscopy in Biology: Microscopy and Methods, ed. M.A. Hayat. Academic Press, New York./ pg 1-22. 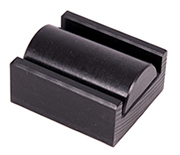 The Five-Slide Gripper accommodates five microscope slides in one staining procedure. A Fool-Proof method for the mounting of serial sections on Single Hole Grids. These plexiglass slides are 3 x 1" (75 x 25 mm) and 1 mm thick. 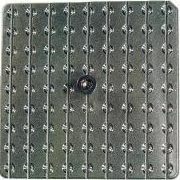 They prevent wrinkling and section loss while mounting sections on the grid. The procedure is simple: A Fool-Proof Method for Mounting Serial Sections on Single Hole Grids. Observing the ultrastructure of cells under an electron microscope is an important aspect of biological research, especially in the neurosciences. Unfortunately, preparing a sample for a transmission electron microscope is a long and difficult process. 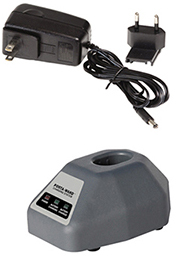 This product was designed to simplify the preparation of samples and make the process more time efficient. 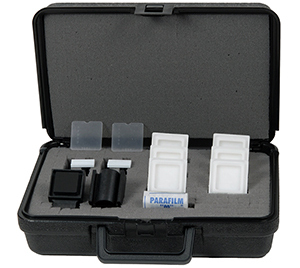 Kit includes: Modified Hiraoka Staining Tray (6), Modified Plate Holder, Parafilm Well Holder, Staining Tray Space Insert (2), Grid Support Plate (2), Parafilm. Hiraoka JI. 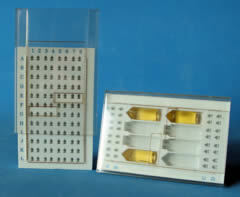 A holder for mass treatment of grids, adapted especially to electron staining and autoradiography. Stain Technology 1972; 47:297-301. Seifert, P. Modified Hiraoka TEM grid staining apparatus and technique using 3D printed materials and gadolinium triacetate tetrahydrate, a nonradioactive uranyl acetate substitute. Journal of Histotechnology. 2017. 40 (4):130-135. 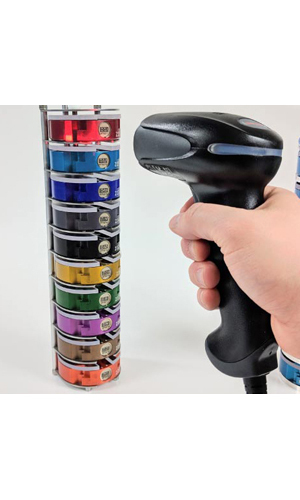 This unique staining device allows you to stain up to 25 grids at one time or as little as one The Matrix system has a simply alpha-numeric identification system. 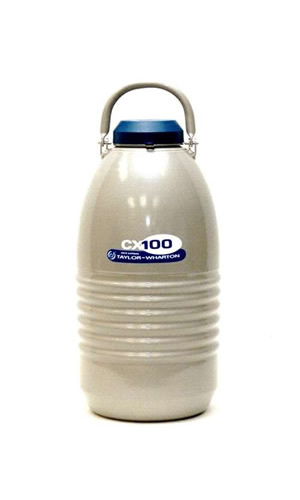 The unit is not solvent or chemically resistant to acids so all stains should be aqueous based only. The system requires very little stain and you may use different vessels for each stain. 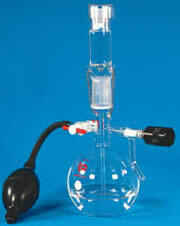 An all glass apparatus. It casts uniformly thin films of parlodion, formvar, or butvar directly onto 1x3 microscope slides. The film casting solution can be used repeatedly. A built-in fine-pressure-release valve helps control the speed of drainage. The thickness of the film is controlled by the concentration of the film solution and the rate of the drainage. 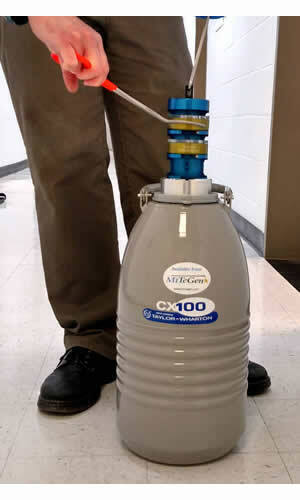 The unit requires 100 mls of film casting solution to start. 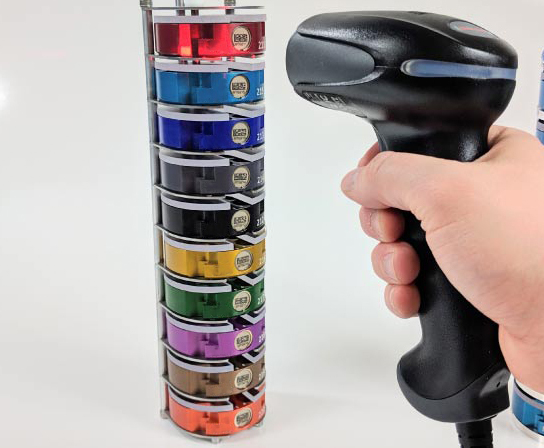 A helpful device for multi grid staining. If instructions are followed carefully you can say good-bye to precipitate and dirt. The Grid Stick is made from a thin, but rigid alloy that does not react with commonly used organic solvents or stains. The stick itself measures 4 mm wide, 75 mm long and has a slot along its center with small undercut notches on one side to make grid removal simple. A small area on the top of each stick is reserved for identification. 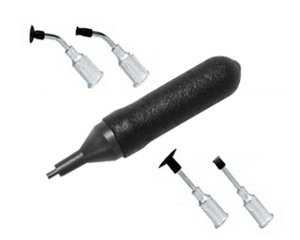 The Grid Stick is coated with a specially-formulated pressure- sensitive adhesive. This adhesive is resistant to solvents used in conventional staining methods (e.g., water, alcohol, ethanol) and aggressively holds the grids in place during staining, emulsion coating, carbon coating, shadow casting, serial section collection, etc., yet will not remain on the grid once it is removed from the stick. During staining the grids are held in the same plane as the solution flow, minimizing the risk of breaking the formvar film and, or collecting surface debris. Grids may be stored, handled, and examined with minimal effort. For example, if your grids are on SynapTek Grid Sticks you can simply place the stick on the stage of a phase microscope, identify the material (you will see outlines of large cells), and determine its condition (i.e., holes in material, dirt on grids) in only a few seconds without disturbing a single grid. 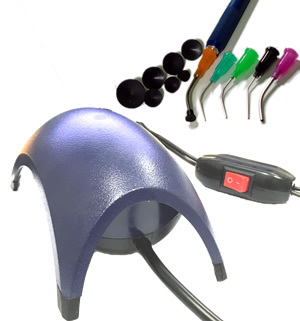 In short, you will find that the SynapTek Grid Stick is simple, easy to use, and most importantly, highly reliable. 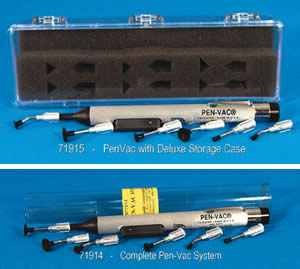 Grid Coating Pen For TEM; Coat Quick "G"
The Coat-Quick "G" pen improves the adherence of tissue sections onto the grids. With a touch of the pen to the grid, a thin layer of coating is applied to the grid. Drying takes place in approximately 1-2 minutes at room temperature. After it has dried the grid is ready for tissue mounting. The pen is also used in pretreating grids prior to mounting supporting films such as formvar and carbon; it minimizes dislodging, widening, or breaking of the support film. Powered by AA batteries. 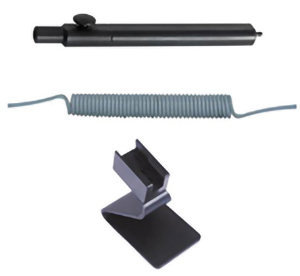 This pen helps to flatten and separate tissue sections and reduces compression in thin sections. Available in two models: Wax Pen 1 is powered by one AA battery; Wax Pen 2 is powered by two AA batteries. Both pens are using the same tip. Replacement tip (Cat. #72679-RT) is a straight one. Replacement tip (Cat. #72679-03) is a set of three different configurations: Straight, Hook, and "U" Shaped Tips. Perfect Loop for Light Microscopy (large sections) The outside diameter of the loop is 7 mm. This staining dish is made from clear glass and has 10 cells in 2 rows of 5 each. Each cell is 2 mm deep and holds 0.15 ml of solution. Very useful in specimen preparation, EM staining, and Boerner-Jones-Lukens microfluocculation test. Measures: 108 X 57 mm (4¼" x 2¼"). 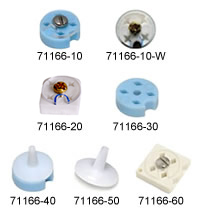 Porcelain Micro Spot Plate is ideal for microchemical applications. With three concave depressions. 12 cavities on a white porcelain plate. Used for staining and color reactions. They measure: 4⅝" (L) x 3½" (W) (118 x 90 mm). Cavity depth: ¼" (6.4 mm). Our economical glazed porcelain plate is made from high purity raw material, uniform in quality and resistant to acids and alkalis. It can withstand sudden temperature changes without cracks, explosion or deformation. Under normal conditions, the glazed plate can sustain a temperature of up to 1050°C. Very similar to the white porcelain plate, this PP plate comprises 12 cavities of approximately 1 ml capacity and is economically priced. This plate is very high quality, unbreakable as well as autoclavable. These spot plates have three depressions 21 mm diameter x 7 mm deep. The tray is 28 mm x 85 mm. 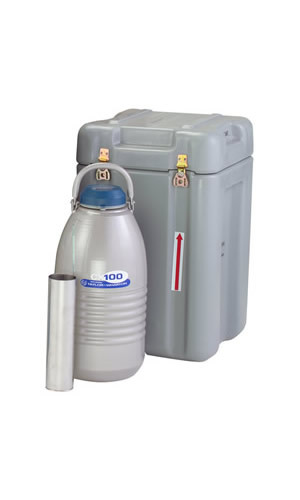 Made from low density polyethylene and will withstand temperatures up to 80°C. The shipping weight is 0.6 lb per case of 40. A 9 cavity Pyrex pressed plate which offers a clear view for observation by transmitted light. The plate measures: 4" (L) x 3 ⅜" (W) (100x85 mm). The cavity is ¼" (6.4 mm) deep with a ⅞" (22 mm) opening. Made from white silicone, a non-reactive material. Pad has 40 cells in 5 rows of 8 each. Each cell is half-sphere shaped with an opening of 6 mm dia. and 5 mm deep. A few drops of staining solution is added to the wells and grids are then immersed and retrieved as per staining procedure. A watch-glass plate comes with each dish to reduce oxygen and evaporation. A clear watch glass which measures 65 mm(OD) x 50 mm(ID) x 10 mm(Deep). The glass is grooved and has a recessed bottom which allows for stacking and prevents scratching. It is ideal for staining and specimen preparation. The EMS Staining plate for Electron Microscopy was developed by Dr. Miguel Berrios, at SUNY at Stony Brook, Dept of Pharmacological Sciences, School of Medicine, New York. The chemical etching process, antibody incubations and final staining with heavy metal salts of each grid is performed in the small cone-shaped wells on the EMS staining plate. The EMS Staining Plate for electron microscopy post-embedding staining and immunohistochemistry offers several advantages over all other commercially available staining devices. 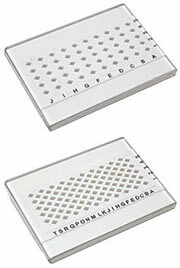 The base plate is a solid piece of chemical-resistant silicone 127.5 mm long, 85.5 mm wide, 11.5 mm thick with 96 cone-shaped wells organized (like the microtitration plate) in parallel rows of eight, using the lid of a 96-well Falcon 3072 Microtest™ III Plate as a cover. The base has two notches to serve for orientation and a 1.5 mm x 4.4 mm deep lip where the cover rests. Each well is an inverted cone 7 mm in diameter and 2 mm deep. Grids either float or rest at the bottom of each well. 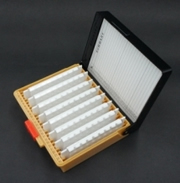 The wells allow incubation of a grid in 12-60 microliters of solution without reagent loss due to adsorption or cross contamination, even when the plate is tilted up at 70°. Due to the shape of the well, the flat surface of the grids never come into contact with the walls of the well, both facilitating sample staining and grid recovery. Reference: Berrios, Miguel; (1991), A Staining Plate For Electron Microscopy. 48: 90-92. 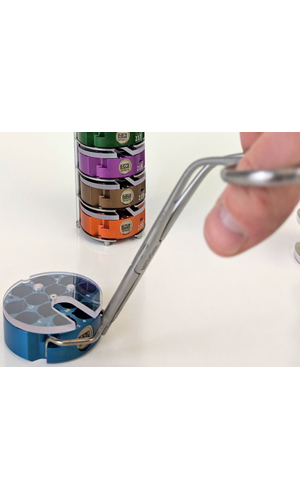 Handle delicate miniature objects without scratching, breaking or pinching. 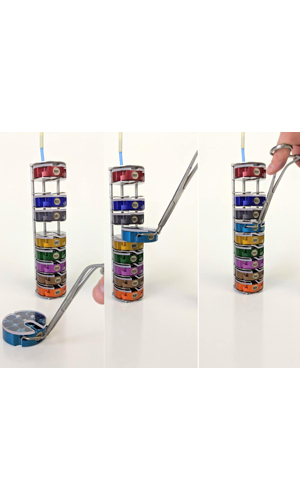 The system avoids contamination of parts and performs functions that tweezers does such as sorting, picking up, holding, carrying, and transferring. As well it is an alter-native way for handling cover slips without the use of forceps. 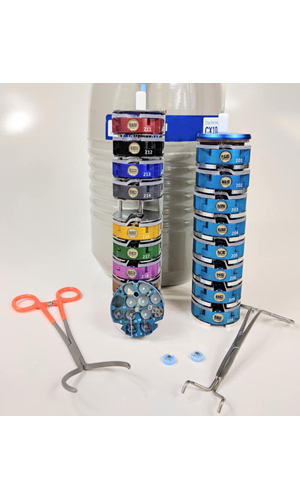 Vacuum Pick-up System complete set: Vacuum Generator, Aluminum Vacuum Pen, Five Vacuum Tips, Set of eight Rubber Vacuum Cups (size ranging: ⅝", 9/16", ½", 7/16", ⅜", 5/16", ¼" and 3/16"), an In-Line Filter, and 4 ft (122cm) of Vacuum Tubing. One Pen with 6 Probes and Cups. (6 Probes: 3 angled, ⅛", ¼", ⅜" and 3 straight ⅛", ¼", ⅜").